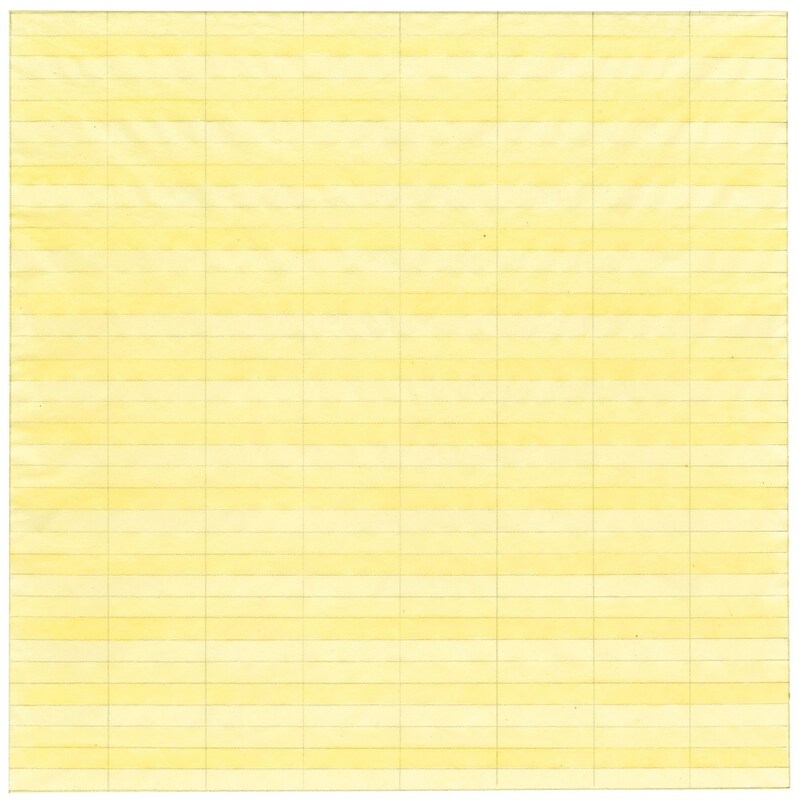 In the early 1960s, Agnes Martin’s geometric compositions evolved into what would later be seen as her signature style: the square grid. Referring to these paintings, the critic Lucy Lippard described them as ‘legendary examples of an unrepetitive use of a repetitive medium’. More and more I excluded from my paintings all curved lines, until finally my compositions consisted only of vertical and horizontal lines. “Simplicity,” said Martin, “is never simple. It’s the hardest thing to achieve. I’m not sure the West (the Western culture as opposed to Zen-traditions) understands simplicity.” For Martin, her quiet gestures and numinous colors are a distillation of the intuitive “beauty” and “perfection” inherent in nature and the mind. Why do some of us experience her art works as if they were sacred rituals, while others couldn’t care less? How do we connect emotional to art as abstracted as this? Long looking at paintings is equivalent to being dropped into a foreign city, where gradually, out of desire and despair, a few key words, then a little syntax make a clearing in the silence. Art, all art, not just paintings is a foreign city, and we deceive ourselves when we think it familiar. No one is surprised to find that a foreign city follows its own customs and speaks its own language. Only a boor would ignore both and blame his defaulting on the place. Every day this happens to the artist and the art. We have to recognise that the language of art, all art, is not our mother-tongue. I think Winterson has created a very useful image of what art looking could – should – be like. I very much like that she challenges us, the viewers; it’s not about having all kinds of background information about the art you see, it’s not about trying to decode a secret message – getting it right. It – looking at art – is about quieting down, listening, letting the art speak – be willing to not understand, but still try. There is no theory to explain it all, what matters is the meeting; you and the work of art, and what is created between you – . Geometry has nothing to do with it. It’s all about finding perfection and perfection can’t be found in something so rigid as geometry. You have to go elsewhere for that, in between the lines. Art can answer questions that you didn’t have words to ask. I think travel does too, for many people, so I like this comparison. Honestly though, many people operate on a level of boorishness, rarely pausing to acknowledge their own unanswered questions. “We have to recognise that the language of art, all art, is not our mother- tongue.” Yes, indeed. Lovely post, Sigrun. Thank you, Karen! Glad this post found a good reader! What I really like about Winterson’s statement is that if we accept art to be a kind of foreign language, it – as a result – becomes a lot easier for us to not fully understand, to relax into the not knowing. That there is a collaboration between artist and viewer on what is evoked by an artwork for the viewer is very important to me. And yes, visual (and other) artists develop their own languages of art. These visual languages can be “learned” or apprehended (to at least some extent – or, to a great extent) by a viewer looking at an artwork with an open mind, especially over time and by viewing many works by the same artist. The viewer doesn’t need to be able to articulate an artist’s visual language in words to have a strong feeling for a work of art. It is very much the same with music (and music was very important to Agnes Martin).